I have always loved the water. And boats. Boats of any kind. Water does basically the same thing for me that mountains do… gets my heart beating a little faster, gets my senses opened up and really working to the max, challenges my ability to navigate it safely and successfully, and renews my appreciation for the crazy, wonderful elements in nature that we have to work with and play with in this life. The San Juan weather can be quite different from Seattle’s weather, and that was the case for us. Warm, sunny days with few clouds and no rain during our time there. We toured Friday Harbor, of course – a cute little town on a hillside overlooking the harbor, several good restaurants and cafes with great views. The main bar in town is a place that has been there a long time – Herb’s. Food and drink are reasonable in Friday Harbor… lodging’s a bit pricey. But it is a somewhat remote tourist destination, after all, so what do you expect, right? There’s a small airport at Friday Harbor, but the ferry from Anacortes, (which is the homeport to all the San Juan Islands) is the unanimous choice to get to and from San Juan Island. One can rent a sea plane from Seattle to Friday Harbor, and I’d love to do that sometime. Are you reading this, B?? In the evenings we’d have a cocktail before dinner, usually in the living quarters below. The Ambition is wonderfully appointed and comfortable… almost roomy! I personally loved being below decks… sleeping on the Ambition was heavenly. Our first day there, Brent & Jill took us for a “cocktail cruise” on a little motorized party boat. We putted around Friday Harbor and looked at the boats and beautiful homes that sit just above the water’s edge. Jill and B brought fresh shrimp, salami, cheese and crackers and appropriate libations for the short journey. As you know, I LOVE fresh shrimp, and it was delicious! We had a great little cruise, lots of laughs and a great tour of the harbor. Our 3rd day there Brent invited me on a trip over to Anacortes on a boat that had been damaged in a recent accident. I think they called it a trawler. That’s it, the one in the middle. A 2-hour trip each way, easy, great scenery. The trawler did 8 knots, 7 comfortably, I was delighted to go with him, and learned a little about navigating the San Juan Islands. Here is our route, from left to right, both over and back. For a sailing experience of a lifetime, go to Brent’s website and check him out. I highly recommend him! Like I said, the mountains and the water… when you’re a mountain guy, a boat ride of any kind – even a raft or kayak down a river, is always a special treat. 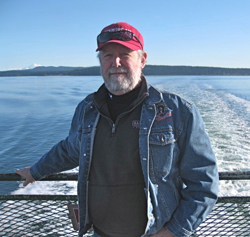 For me, the first trip to the San Juan Islands, with someone who really knows them, is….. totally awesome. Steve, this brought back great memories of our father-son San Juan trip back in 2007. Darren has a framed photo in his house of him and his brother, Chef Andrew, standing on the pier at Friday Harbor. This is a wonderful part of the world and I envy your opportunity to sail there. But please be careful…you just might be infected by that sailing bug, and once you’re bitten, you are hooked for life! Keep writing and keep sailing! P.S. Loved the trailer and can’t wait to see the feature length film!